Hello, dear readers. It’s been a while. But back to the reason for this post. Recently, I saw a trackback comment from SQLBlimp that listed my index defrag script as #3 on its SQL Server Helpfulness Hall of Fame. This filled me with mixed emotions; while it made me happy that the script has been so helpful to so many people, I couldn’t help but feel sad because I knew I would no longer be keeping it updated. I have spent countless hours on this script, which has won numerous awards and has been mentioned in blogs, presentations, online publications, & books. It’s also still extremely popular; I stopped paying attention to its metrics when it broke 100,000 downloads 3 years ago. Similarly, I’ve been surprised to observe that sqlfool.com, which broke 1 million visits in April 2014, now receives more web traffic today than it ever did at the height of my blogging activities. For this reason, I have made two decisions. First, I will keep this blog online so that people can continue to stumble across blog posts that, while a couple of years old, are still largely relevant. Secondly, I have decided to open source all of my SQL Server procedures & scripts on GitHub. I haven’t yet had a chance to upload all of my scripts, but I started with the most popular ones (based on traffic stats). These scripts are available in a single repository to make downloads easy. And, if you are so inclined, feel free to contribute back to the repo. For the index defrag script in particular, I have some automated regression tests that I can run against any pull requests to aid in merge approvals. Recently, I needed to audit indexes on two different servers. I wanted to compare things like index keys and included columns, partitioning keys, unique constraints, clustered indexes and primary keys, and filter index definitions. Basically, I wanted to make sure that the indexing of two databases on two different servers were completely in sync. To do this, I wrote the following scripts. The first script will audit a single database or even a single table. The second script once more makes use of Aaron Bertrand’s sp_foreachdb procedure to iterate through every database on a server. To do a quick and easy compare, I dumped the results to a single table on each server and used Red Gate’s SQL Data Compare to find the differences. This script will only run on SQL 2008 or newer because of the filtered index component. See Patrick’s solution in the comments below for a mod that works in 2005 too. It worked for me, but YMMV depending on editions, collations, creative settings, etc. I don’t currently have access to any instances older than SQL Server 2012, so please respond with any backwards compatibility issues. I’ve figured out a couple of tidbits today that I wanted to share. 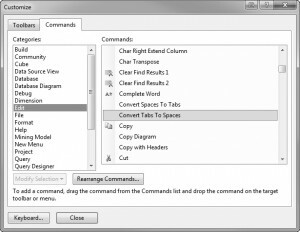 First and foremost, I’ve discovered a (new to me) option in SSMS to convert tabs to spaces. I had previously seen the “Untabify Selected Lines” option (under Edit –> Advanced), but this only seemed to remove the tabs at the beginning of the line; it would not remove in-line tabs. I’ve now found another option that will remove the tabs throughout the selected code. Disclaimer: I’m using SSMS 2008 and have not confirmed this in other versions of SSMS. 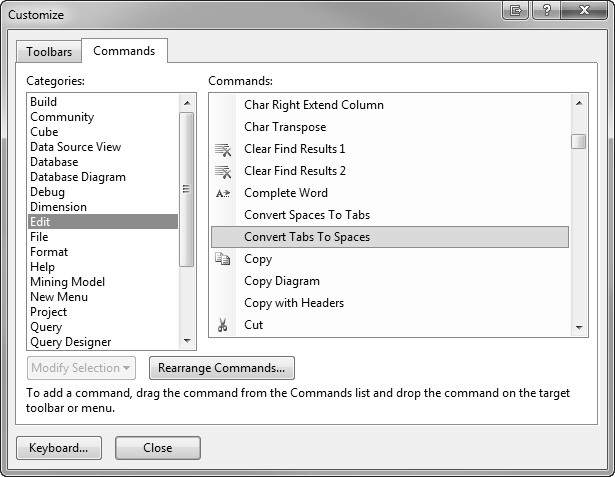 Click on the Commands tab, then navigate down to Edit –> Convert Tabs to Spaces. Once you have found the option you want, click on it and drag it to your toolbar. This script isn’t as polished as my usual, but it’s really just a quick-and-dirty way of checking for mismatches in NULL properties. I’m currently working on the logic migration of data marts from SQL Server to Teradata. While another team is working on the actual table migration, it’s still helpful to have some data in the tables for developing against. The easiest method I’ve found to do this is to use BCP to export some sample data. So of course, I’ve created a SQL script that will generate the BCP code for me. Because that’s what I like to do on Sunday evenings. What do I mean by “uncleansed data?” I mostly mean user-inputted VARCHAR columns that contain pipes (|), tabs, carriage returns, and line feeds. These types of characters tend to mess with the data import process. Also, I’ve not yet found a way to import a data file into Teradata where a non-nullable character column contains an empty string (”). Obviously, the vast majority of the data is fine, but even one of these issues can throw an error during the import process. I’ve modified the script above to handle these specific exceptions. Since I’m only using this data for testing purposes, I found it pretty easy to simply replace the offending records with ~. I’m not sure if anyone else has a need for this particular script, but I figured you could modify it pretty easily to do whatever you need. One note: I’ve found that copying this code into a batch file will actually render the CHAR functions, i.e. CHAR(13) will be replaced with a carriage return in the script. To avoid this, copy and paste the BCP script directly into your command window. Not familiar with BCP? Refer to my blog post on BCP Basics to help get you started. Are You Approaching Your Partition Range Limits? /* Grab results for each database and store in our temp table. Recently, on a conference call presenting data growth rates and database capacity projections, I had a top-line executive ask, “But how much of that data are we actually using today?” The question was met with silence; unless you have rigorous auditing in place — and kudos to you if you do — it’s a difficult question to answer. But it begs the question, is there some way to gleam this information from SQL Server? I think the answer is “yes,” if you make some assumptions and understand what you’re looking at. SQL Server collects stats about every time an index is used and how it is used (i.e. whether a user seeked or scanned the index, etc.). It also provides a DMV to view these stats: sys.dm_db_index_usage_stats. This DMV provides a wealth of great information, but to answer our question of “What data is actually being used?”, we have to refine our criteria. Are we talking in terms of table counts or data size? I’d argue that data size is more important than table counts; one unqueried millow-row table is more wasteful than a hundred ten-row tables. Also, are we looking at indexes or content? From a database perspective, I’m more interested in indexes: how much space are we wasting on unused indexes? To identify this, I need to look at the activity on each individual index. From a business perspective, I would be more interested in content (i.e. tables): how much business information is being stored that no one is even looking at? To answer this question, I need to roll up all index usage to see if *any* of the indexes on a table were used. Since both were of interest to me, I decided to write queries to answer both questions. Lastly, we need to understand the flaws with this data. Chiefly, I cannot tell whether a user requested one row from a million-row table, or if [s]he needed all of the data in the table. This is a pretty important issue, especially with large historical data stores, and it’s where I have to make the biggest assumption: if even one person looked at one row in the table, I count all pages in the table as having been accessed. This will give you an approximation of how much data is being utilized on a server. an idea of how much data we've accrued. The first result set examines the utilization of indexes, and the second result set examines the utilization of data at the content (table) level. For example, if we look at Database6, we’ll see that we are only utilizing 77% of our indexes, but we’re looking at 99% of our table data. So this is a good indicator that we have some unused indexes to clean up in that database. It’s been quite some time since my last index defrag script update. A big part of the reason for that is because I wanted to implement many of the suggestions I’ve received, but I just haven’t had the time. I still have those changes planned, but I’m not sure quite when I’ll get to it. Rather than continue to wait for a major release, I’m releasing a small update to my defrag that will take care of the most common complaints I receive. Time Limitations: stop defragging after the specified amount of time has elapsed (@timeLimit). Please note, it will not kill a defrag that is currently in process, even if it exceeds the threshold. Defrag scheduling: choose which days to defrag certain indexes, or exclude certain indexes altogether, by using the dbo.dba_indexDefragExclusion table. Defrag priority: choose whether to defrag indexes in ascending or descending order by range_scan_count (default), fragmentation, or page_count. Commands-only mode: Choose to just log the current defrag status and print the defrag commands, rather than executing them, by using @executeSQL. … and tons more! Please read the parameter list and notes section for details of all the options available. It’s up to you where you create it. You could technically create it in the MASTER database, but I recommend creating a utility database for your DBA administrative tasks. You need to be on SQL Server 2005 SP2 or higher. Purpose:    This function parses string input using a variable delimiter. CAUTION: TRANSACTION LOG SIZE SHOULD BE MONITORED CLOSELY WHEN DEFRAGMENTING. DO NOT RUN UNATTENDED ON LARGE DATABASES DURING BUSINESS HOURS. used if @executeSQL = 1. @defragSortOrder      The sort order of the ORDER BY clause. Valid options are ASC (ascending) or DESC (descending). index defrags; expressed in minutes. if not specified, all tables will be defragged. been defragged. This can span multiple executions. 10k pages, performs a DETAILED scan. this mode, AS it can cause performance issues. than 1 extent (8 pages). are stored in dba_indexDefragStatus table. large indexes for non-business hours. can support multiple page count thresholds. warranties or merchantability and/or fitness for a particular purpose. and internal corporate purposes, provided that this header is preserved. prohibited without the author's express written consent. A couple of weeks ago, I was working on a Microsoft PDW proof-of-concept (POC) and had to measure compression ratios. In order to do this, I fired up SSMS and wrote a little script. The script will iterate through all tables in a database and run the sp_estimate_data_compression_savings stored procedure. This will only work in SQL Server 2008+ versions running Enterprise edition. If you’re not familiar with this stored procedure, it basically will tell you what effect PAGE or ROW compression will have on your table/index/partition, etc. There are pro’s and con’s with compression. What I’ve tended to see is that compression has very positive results on space, IO, and query duration, with a negative impact on CPU and write speed. Like most things, it’s a trade-off and the results will vary by environment, so I recommend you do some testing before you apply compression to all tables. I tend to use compression mostly for my historical tables and partitions and leave my recent data uncompressed. And, back to the script, I use this stored procedure to estimate the impact of compression and to determine whether to use PAGE or ROW compression. PAGE is a higher level of compression, which means it’s also more expensive in terms of CPU, so if the difference between the two results is negligible, I’m more apt to just use ROW compression. Now that my impromptu compression discussion is done, let’s get to the actual script. One final word of caution, however. This is an IO intensive process, so you may want to run it after peak business hours. Identity Columns: Are You Nearing The Limits? I use identity columns frequently. After all, identity columns make great clustering keys. But it’s important when using identity columns to check on the amount of values you have left before you reach the limit of your data type. An identity column has a fixed amount of values it can use based upon whether you specified tinyint, smallint, int, or bigint when you defined the column. If you reach this limit, your inserts will blow up and cause a Chernobyl-like SQL meltdown will begin to fail. I just finished an audit of my tables and thought I’d share the script. I would like to warn that this script is *not* perfect… namely, it doesn’t handle negative integer values very elegantly. It also doesn’t know if you started your seed at zero, approached your max positive limit, then reseeded to the negative limit (see my “quick and dirty fix” tip at the end of this article). before we start throwing up the red flag. If you find yourself quickly approaching your max limit and need to implement a quick and dirty fix, you can reseed your identity column. Of course, this only works if you started at zero instead of the actual lower, negative limit. Like what you see? Subscribe! It's a free and easy way to stay informed of my latest tips and time-saving SQL scripts. The views expressed on this blog are mine alone and do not represent the views of my employer, GoDaddy.com. SQL Fool | Powered by Mantra & WordPress.